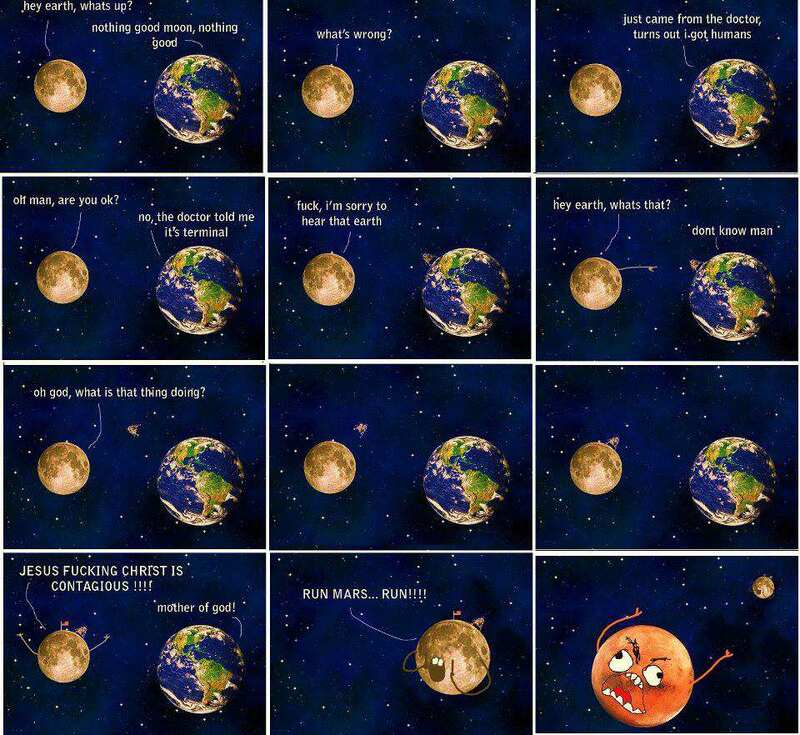 Is the Earth really happy? Do we deserve to live here? If we take a survey asking all the people around the world if they deserve this blue-green-white-brown-gray planet called Earth, I'm sure an overwhelmingly large number of these are going to say, "Yes, of course!". Well, what other response could we expect? The opinion of the majority is expected as this is the mind's response. Even though at the back of the mind of everybody, the knowledge that we haven't treated Earth with respect is there, that the "I, me, mine, my" mentality is fully intact and preserved. If you open up your mind a little wider and take an unflinchingly honest look at mankind and its history, what will you find? Will you still say "Yes, of course!"? During the Earth's cruise for the last few thousand years, masters and prophets have come and go to teach us "truths" and the ideal way on how to live. People have even worshiped some and made god out of the few "chosen" ones. But what happened? People degenerated. People prayed to them for consolation of the mind, but still lived the same way, which made me think that we have just merely played a mind game. Conservatives, religious, all the same tried to shove it into our mouths, but there isn't any consistency paralleled to what they've done. Granted, we have made a lot of advancement in technology and industrialization, but did we made those for the benefit of the gentle mass of soil slash water slash gases that gave us something to live on? No. We have always been 'What's in it for me?". Oh yes, we have been protesting on politicians and gigantic corporations with their greed for the present condition of the Earth, but what we failed to realize is we're all accessories for the world's biggest crime ever committed. You're gonna ask me how? Oh come on. What have we done? We agreed to partake on those politicians and corporations by accepting their ways, by reaping profit out of them, by being a part of them, and even by just doing nothing and being neutral about it. Sadly, everyone is responsible regardless of the political and social divisions we live in. If we look at it in a very different perspective, let's say, nature's, mankind is some "kind" of disease for Earth. A cancer. An organism that lives in disharmony with its own kind. An organism whose lifestyle is not completely aligned with nature. An organism guilty beyond reasonable doubt of abusing the bounties given by nature for its own egotistical and financial gains. An organism that has allowed money to be the ruling factor. Now, if we redesign the survey and let all of which has life and no life, i.e. trees, animals, minerals, plants, nature itself, to partake and answer, I'm sure we will definitely be voted out. So, you ready to greet someone or the world a happy Earth day? Greetings don't make differences. Let's act now before we're booted out of here. 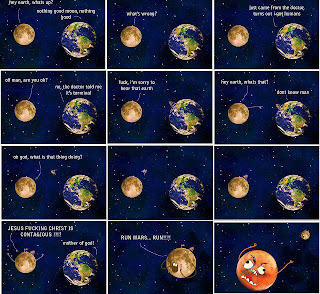 I found a comic, thanks to The Idealist, that looks funny and simple, but shows a deep meaning of what we are in the eyes of our so-called heavenly bodies. Posted in awful truth, cancer, earth, earth day, Earth day 2012, mankind, people . Bookmark the permalink. RSS feed for this post. 3 Responses to Happy Earth Day; Seriously?